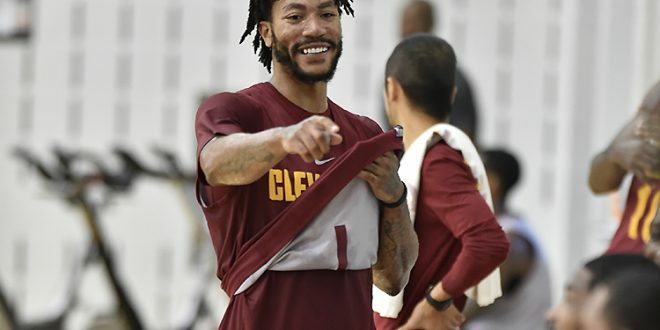 Derrick Rose took a two week absence from the Cleveland Cavaliers. His health will be a key component to their post-season run. When the kid from Chicago, named Derrick Rose, got drafted to his hometown team, the Bulls, everyone knew that he would be a star. In his first year in the league, he won the 2008-2009 Rookie of the Year honor and got the Bulls back to the playoffs. In only his third year, he became the youngest NBA MVP and led the Chicago Bulls to a league best 66-16 record. It looked like the Bulls were returning to the glory years of theprevious decade but then everything went crashing down. In Game 1 of the 2011-12 playoffs, the reigning MVP Rose went down with a torn ACL in his left knee in the fourth quarter. It caused him to miss the next season. Once seemed as the new hope for Chicago, his career began to fall. He returned in the 2013-14 season. His return did not last long as he suffered a torn meniscus in his right knee. The injury held him out for the remainder of the season. Rose’s multiple injuries have caused a fall in his production level and he is noticeably not playing with the same confidence he used to. His stint in Chicago was clearly done as the organization began to build a team around rising star Jimmy Butler. Rose was traded to the New York Knicks prior to the 2016-17 season. When he got traded, it was thought that he would revitalize his career with a change of scenery. Of course, the Knicks were the Knicks and missed the playoffs. But Rose faced different problems. Rose disappeared from the team without notifying them and was fined by the team. He then tore his left meniscus at the tail-end of the season, causing him to miss the rest of the season and have a fourth knee surgery. Hope still didn’t die for Rose. He signed with the Cleveland Cavaliers and there was optimism that with LeBron James on his team, life could be brought back into his career. On November 24, Rose notified the team that he wanted to take a leave of absence to re-evaluate his playing career because he was growing frustrated with his injuries. Since, he has contacted the Cavaliers that he wants to play again. Rose was once known as one of the most athletic point guards in NBA history. His injuries have the raised the question if he should call it quits with basketball. Rose is not what he used to be, but I still feel like he has something to left in the tank and have something to prove to the people who makes memes out of his injuries. With him almost guaranteed to be playing in the NBA Finals, in June 2018 and possibly completing this season, it can prove once and for all that he can still ball. Written by Gerald Thomas III, Staff Writer. Photo courtesy of Getty Images.